The only thing wilder than Oklahoma in the late nineteenth century are the tales that continue to surround it. In the days of the Wild West, Oklahoma was teeming with assassins, guerillas, hijackers, kidnappers, gangs, and misfits of every size and shape imaginable. Featuring such legendary characters as Billy the Kid, Bonnie and Clyde, Machine Gun Kelly, Belle Starr, and Pretty Boy Floyd, this book combines recorded fact with romanticized legend, allowing the reader to decide how much to believe. Violent and out of control, the figures covered in 100 Oklahoma Outlaws, Gangsters, and Lawmen often left behind numerous victims, grisly accounts, and unforgettable stories. Included are criminals like James “Deacon” Miller, the devout Methodist and hired assassin. Righteous and devious, he often avoided the gallows by convincing others to admit to his murders. Rufus Buck, a man of Native American descent, targeted white settlers. His crimes against them became so heinous as to cause the Creek nation to take up arms against him. The answer to criminals such as these came in the form of “Hanging” Judge Parker and other officers of the law. Although they were greatly outnumbered, they provided some balance to the chaos. 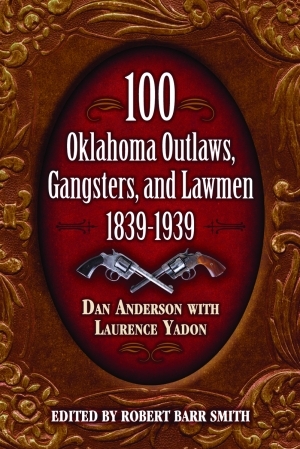 This historical compilation covers every memorable outlaw and lawman who passed through Oklahoma. Dan Anderson is a former newspaper journalist and photographer for Pryor, Oklahoma’s Daily Times. His main emphasis in reporting was on crime, cops, and court cases. Mr. Anderson has been honored with awards from both the Oklahoma Press Association and Associated Press Oklahoma Northeast for his writing and photography. Laurence Yadon teaches mediation at Tulsa Community College. He gives presentations on not only various legal subjects, but also Oklahoma history and crime history. A lifelong student of American history, Yadon has a special interest in the Southwest. A dandy book to have if you have any interest in outlaws and criminals. Those interested in Oklahoma history, outlaws and criminal history will enjoy this book, and it is highly recommended to them.